Lady and the Blog → Travel → Travel Tip Tuesday: Have A Ton Of Extra Take-Out Containers? Travel With Them! Travel Tip Tuesday: Have A Ton Of Extra Take-Out Containers? Travel With Them! I’ve become very aware of my carbon footprint as of late. I try to do all that I can without having it interfere with my life. I would love to use washable diapers… but that just ain’t gonna happen. So I make adjustments where I see fit – and one place that I found easy to correct was my travel cases. 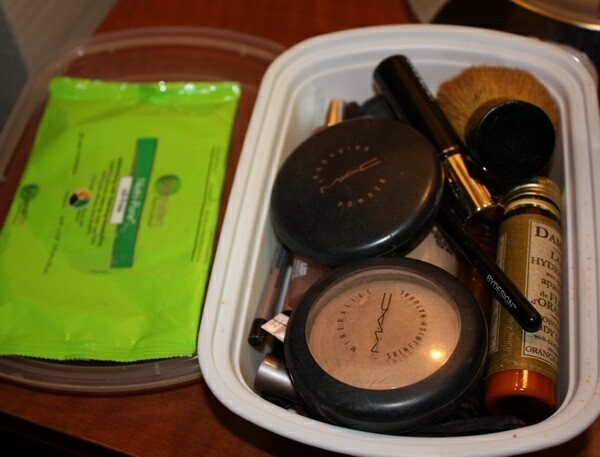 A few months ago, if I was packing for a trip, I would have a gazillion Ziploc bags housing my make up. I think I used about 5 of them to store everything from toothpaste to eyeliner to medication. Now I use my old Chinese take-out containers! It’s one of our favorite foods and I hate to just throw them all away. So this is their new function and I LOVE it because it’s reusable and I save money on replenishing my Ziploc stash. Do you have any tips for travel storage? Would love to hear them! In my household we use those plastic take-out boxes for everything imaginable. Never thought about using them for make-up though. I’ll keep that one in mind.